Facing the Hudson River in the West Village, the Jane hotel is a brand-new 'upscale hostel' for the discerning traveler. 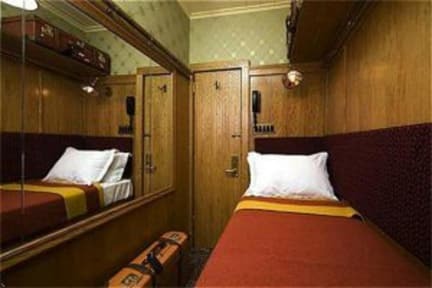 With compact singles going for $99 and a swanky scene, this hotel is a unique choice with history to boot. From 1908 to the 1940s, what is now the Jane served as hotel for sailors, The American Seaman's Friend Society Sailors' Home and Institute. 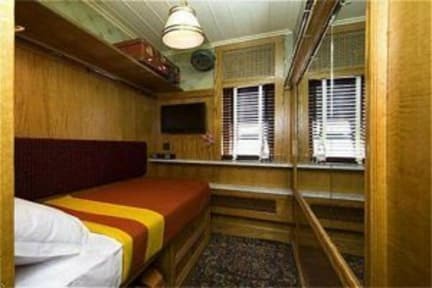 The building's nautical past is preserved today: the 'cabin rooms' are as compact as a sailor's quarters, though thankfully they sport some modern touches like an iPod dock, flat-screen TV, and A/C. Larger 'captain cabins,' featuring views of the Hudson, will be available in 2009. Beds sleep one and are attractive, if rather narrow, with storage space below and 'train racks' above for additional storage. The effect is both charmingly old-fashioned and chic. All rooms have a phone, alarm clock, free wi-fi Internet access, and even a bathrobe and slippers. Guests share bathroom facilities (two showers, two toilets) with the entire floor; there are plans to install a second bathroom on each floor in the upcoming months. With great rates, cozy rooms, a fabulous location, and what promises to be a fun combination of vintage furniture and hip amenities, this hotel provides a good deal for the adventurous traveler on a budget.